Q: I have a house-hunting question for you. What do you look for? What do you look past? Help! My main complaint of all the older homes that we’re looking at in our price range is that they all feel dated, but that seems to be what you guys look for. How do you know which dated houses are worth buying and which ones are lost causes? I keep worrying we’ll end up in a money pit! – Aviva (not the one from Housewives of NY). So although we’re hardly pro house-hunters (we’ve only done it two times), I think we’ve learned that the sweet spot for us is to completely ignore things we know we can change. If the walls are a color we don’t like, we don’t even pay attention since we know it can easily and affordably be updated. 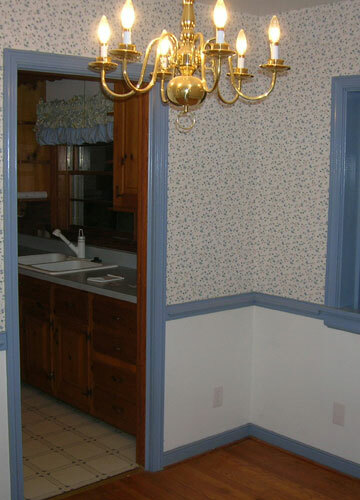 Same for the color of cabinets that we can potentially paint, or wallpaper that we can remove. Things that we can’t change as easily are what we pay the most attention to (ex: the floor plan of a house, the location of the kitchen and all the windows, the size of the bedrooms) – you know, things that would be a lot of money, and trouble, to alter. For those who have a harder time seeing past the bad cosmetic things (like dated curtains and crusty old wallpaper) it probably helps to look at inspiration images in magazines, online, etc and save things that you love (in a binder, on Pinterest, etc). Then stare at them to see if any of those rooms could inspire something. For example, if you see a room that looks totally different than a potential home’s living room but look closer and realize it’s the same size and shape, you could totally repaint and hang curtains and otherwise decorate it to get that look in your space. Know what I mean? Update: Oh and as for avoiding a money pit with structural issues or other expensive upgrades you didn’t see coming, we definitely value getting a thorough inspection! Of course they can’t always catch everything, but we’d never buy a house without one and you definitely have much higher odds of finding potential issues (and then being able to opt out of the purchase) than if you skipped the inspection. We hire someone super thorough who is highly recommended and in each case he spent a minimum of 3+ hours crawling under the house, on the roof, looking into vents, etc – our guy got verrry friendly with each house. It can definitely keep you from ending up with a lemon! At least for our two house purchases it has worked out well. So what about you guys. What do you look for or look past when it comes to house hunting? Do you make must-have lists and must-not-have lists along with nice-to-have lists? It’s definitely smart because that way you won’t let something on the nice-to-have list creep into your brain and convince you buy a house that’s missing a few of the must-haves. One thing many jurisdictions have on line is the ownership history with a record of what building/plumbing/elec permits were pulled. This is really informative because if you have a, for instance, a bathroom that is not recorded on your taxes and no record of plumbing or electrical permits,the bathroom was probably installed without a permit. This also means there was no inspection of the work, no quality control. This can certain cost you down the road! I second an inspector. Ours caught what would have been a super expensive problem…basically the owners took out a wall (non load bearing) and removed some heating ducts. We would have had two rooms without heat once winter came. The sellers agreed to fix the issue. My dad takes a screwdriver and flashlight whenever he looks at a house. The screwdriver to check for termite damage and a flashlight to look in dark spaces. Wow- that’s a great catch! I had to look past some major cosmetic stuff when I looked at my house. I actually felt like washing my hands after seeing it the first time but felt it deserved a second look after a week or so. It had really gross carpet, terrible paint (both color and all over the carpet! 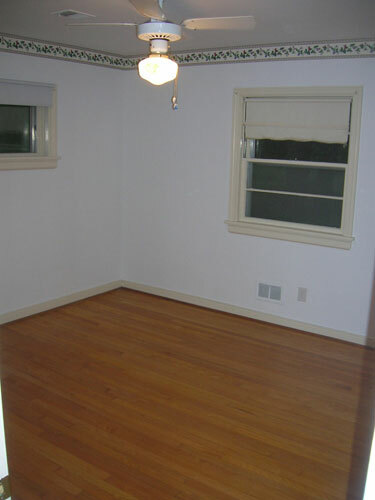 ), dingy popcorn ceilings, dark trim, etc. I also thought it was really dark, but once the black curtains over south-facing windows came down, it turns out its a really bright, airy space! I think I got a deal because I was able to see past the cosmetic stuff. A little elbow grease and new floors and the place looks sooo much better than when I got it! I also look at how the current owner has kept things up. Even with an inspection. If the owners have let things get kind of run down or did things kind of half-assed, then they have usually done that with the upkeep of the house in general and you might have some nasty surprises later. It doesn’t mean I won’t buy the house but I know to factor that into the future budget. For example, the person I bought my current house from did some really stupid thing to cut corners so when it came time to request some things fixed before the sale went through, I just asked for the money and I oversaw the repairs myself. Also, later I found he did exactly what I expected and when I re-do the kitchen I’ll have to replace all the drywall because he glued baseboard around the walls as a back splash. Ironically there is no baseboard around the floor he installed. Just quarter round badly badly done. It would make you cry guys. Not a deal breaker but I knew to expect that kind of thing. You sometimes miss those little details when you are looking at the house to buy. Also, if there is any doubt about something specific, you can get an additional inspector that specializes in something. That means that in addition to the regular inspection, I may be concerned about the age of the wiring so I’ll hire an electrical contractor to inspect the wiring also. Information up front is everything! Oh yes, it’s hilarious (cursing warning for anyone going over there though!). what ever happened to that arch you got married under? In the post about the ad removing the bushes you said you might keep it or did it stay at the old house? It actually stayed at the old house! It was kinda brittle and we worried that digging it up and removing the vine that grew all over it would make it break and then no one would enjoy it, so we left it. Non house-hunting question….What kind of plant are those colourful bushes along the back of your old property? Those are azaleas! Hope it helps! There are also Home Warranty Companies, that if the situation is right and a motivated seller, the buyer could request that the seller purchase one of them. I think they are usually for the first year, in case the a/c goes out, or even a water heater. I had one on my last house, but never used it, so I don’t really have first hand knowledge of them. But if a buyer was jumpy, it might be an extra level of comfort to check into. Oh yes those are great, although we have heard they only cover things that work and break after you move in (so learning something has been broken all along is a preexisting condition so it doesn’t get covered which can be tricky). We purchased a 40 year old house that had great bones, but had been neglected. It had the original 1959 appliances! So we did have the seller purchase a Home Warranty for 24 months. Life saver! We used it three times: oven, water heater, clothes washer. They repaired, did not replace, but that was enough to get us through while we were focused on real fixing up like pulling carpet and sanding the wood underneath and building a deck. Love our cozy house now! We just bought a 1964 mid century modern home that is a total time warp…with a sunken tub and creme and yellow steel cabinets– and I can’t wait to move in and update it! Question…. We are renting our house with and option to buy it. We love, love, love it and the location is perfect… Corner lot, walk across the street to school (huge track and playground), LOVE all our neighbors, etc. Its a 1968 ranch. However, it does have some water damage. Some walls behind the bathroom are ripple-y as well as a wall against the fireplace. Our bathroom is identical to the bathroom in your first house, down to the rotted sub floor! Both bathrooms need to be gutted, the kitchen needs a total overhaul, and two major walls need to come down. After doing your total bathroom gut job, would you go into it willingly again? We want to buy, but nervous about these particular issues. Great post by the way!!! I LOVE you guys!!! We always say that gut job was one of the hardest things we tackled (well John mostly did it since I was baking Clara) but we lived to tell the tale! We would do it again, just probably not in a situation where there are three bathrooms that need it- but one more we could do! Haha. I think it’s important for people to be realistic as to how much work they’re willing to do. Wallpaper, paneling, and ugly bathrooms might not be a huge deal to some (like me, I don’t care), but others might not be able to stomach more than a teeny tiny bit of paint. It’s okay if you hate renovating. Just be prepared to pay more. Also, have an emergency fund. Estimate a large amount. Then double it. Even a thorough inspection might not reveal that you’ll need new plumbing (within a week of moving in). Amen on the emergency fund! A friend who closed the day before I did is now back in serious debt because they took down a wall to open up the kitchen and dining room. They uncovered knob and tube wiring, and had to have the whole house re-wired (apparently in Richmond, it’s all good till you expose it, then it has to go since it’s not up to code), have had serious plumbing issues (that their separate plumbing inspection did NOT uncover….taking the wall down did! ), and had to have the main floor releveled bc of a funky joist (that they knew about, but turned out to be way more extensive – and expensive – than they thought). They now call their house The Money Pit. I definitely agree with YHL! – Unless you’re planning (and I mean, really, really planning) to stay in the house for life, check to make sure you’re looking in a good school district. Even if you don’t have kids and/or are never planning to have kids, reselling a house is a heck of a lot easier if you buy one in a good school district. We did that, and when a cross-country-move-involving job opportunity came along, we were able to sell a house we bought in 2009 this past summer for a minor loss in less than 2 months. Considering today’s market, we feel very fortunate. – If you find a house you think you like, go back another day without the agent. Walk around the neighborhood, talk to some neighbors, and pay attention to how you feel in that neighborhood. If you can, do the same thing after dark. Your instincts for how “safe” you feel, plus the presence (or absence) of people doing things like walking their dogs or playing with their kids outside will tell you a lot about whether this is a safe place to live. Agents can’t tell you that (literally – it’s illegal in most states for them to answer a question like “is it a safe neighborhood”). Seeing the area without an agent in tow can also give you a better sense of whether you’re about to move into an area with crazy neighbors or barky dogs. Honestly, when we bought our house, we had a laundry list of stuff we wanted. We really didn’t get much of it. I could tell from the moment we walked in the door if it was for us. The house we bought was the only house we walked in that felt like home. I’m not sure why — we’ve changed so much (aesthetically) about it that it doesn’t look like it did when we bought it at all. But ultimately, that is what we based our decision on — that the house felt like home when we walked in the door. However, that that we’ve owned our house for 3.5 years, there are a few things in a future house that I would (or wouldn’t) look for. One is at least a two car garage (we have that now and wouldn’t give it up. WI gets cold!). The other is trees. Hate them. Seriously. We have a lot that is just under a quarter of an acre, and we have FIVE trees — all fully mature. We have one tree that is so large, my husband and I can stand on either side and not touch hands (and we don’t have small arm spans). Another tree is only marginally smaller than that one. The other three are in the front yard. Our leaves fall until early December and we can rake, rake, rake, and then turn around and THERE THEY ARE AGAIN! Or we’re mowing the leaves until early December. Never again. I think I would limit a future house to one, MAYBE two trees. You said not to worry about green/blue/pink toilets… but what about pink sinks and whirlpool tub? We ended up buying a house that we love (location, floorplan, etc.) BUT our master has a massive oversized (amazing) whirlpool tub that I have a love/hate relationship with because it is PINK! I love the tub but I hate hate hate the pink. Same with the sinks in the master bath. (Oh and the faucets in all are gold!) So, what now? We already had to replace the toilet in that bathroom, so it’s a normal white now… but what about the rest. Can you paint a bathtub? I am afraid the cost to replace that tub will be out of this world! Ooh professional reglazing baby! It’s around $200-300 but so worth it- they essentially refinish those things to be white instead of pink and they look a lot more clean/classic and less… pink! OH. MY. GOSH. Sherry I love you! I have never heard of this before but I think you just saved my bathroom! Trust me when I say the bathroom is amazing and awful at the same time now. Seriously we’ve owned the house for a year and all I think about is how to fix that tub. This will be one of the first make-over projects on my list for 2013! I will send you before/after pictures! Ha! Thank you! We had our tub refinished before we moved it – it had been done previously and was peeling badly…it was closer to $500, but has a 7-year warranty. HOWEVER, you do have to be more careful about cleaning a reglazed tub (can’t use abrasive stuff) and doing DIY around it. I scratched our glaze when installing a new shower head. Oh yes, great tips! We got our tub reglazed and it was $300 with a ten year warranty and it held up great from following their guidelines. Such a great alternative to replacing things! By the way… I LOVE YHL!! You guys are awesome! I just ordered your book for several people as Christmas presents! I so wish you guys were coming to Philadelphia on your tour. Aw you’re so sweet Bethany! Thanks so much! We wish Philly would end up on the schedule- here’s hoping they add it! Perhaps these are regional things, but in addition to getting an inspection, it’s a good idea to do radon testing, a sewer scope and a gas tank locate if you’re looking at older homes. The sewer scope ended up saving us thousands of dollars because the seller and next door neighbor had to fix a cracked line! Oh yes! We are big on the radon test thing! It saved us thousands of dollars when we bought this house! Don’t know if someone already mentioned this but when I bought my house my realtor had the sellers include a home warranty. It covers a lot of the systems as long as they are working when you move in. It’s already come in handy a couple of times. The house was empty for a few months so some problems showed up after I moved in (the dishwasher wasn’t cleaning dishes very well; the plumbing backed up). I had a home inspection but these were things that showed up after everyday use. The dishwasher was fixed but if that hadn’t been possible the warranty would have paid for a replacement. It’s been a real bonus to have when those little “surprises” of homeownership pop up. Oh yes, those are great! We hear they hardly ever replace anything (they always repair it whenever they can to save money) so it’s a great way to get through the first year (although dreams of getting all new appliances with it, we hear, are few and far between). In our area there are lots of older houses that have additions or finished basements. Our realtor does a permits check when clients make purchases. The permit process is pretty intense here so you know if they got permits that things are to code. To buy his own house, our realtor actually made the seller go back and permit previous basement remodel work – it was expensive, but it sealed the deal for him! It’s true you never know what’s in the walls or basements so this is one more way to rest assured of quality remodeling work. On another note, we paid attention to which way the house faces. We’re in Portland where it rains a lot and getting light into the house when it’s available is important. Facing east ensures we have light in the front of the house in the morning and south facing windows in the dining room and living room help in the afternoon. Our last house had no shade in the backyard. In the summer, the orientation of the house and the angle of the sun made for a scorching back deck and heated up our house. Our new house has a few trees back there and it makes all the difference! We just bought our second home a few months ago. And I agree, your things to pay attention to list is pretty spot on! It’s an amazing time to buy Diandra! Good luck with everything! Cul-de-sac = quieter place for kids to play, but also much less frontage on the street for each house. We entertain a lot, and there is almost no parking for the 15 homes on our cul-de-sac. “Flag” driveway = more privacy, but also – wait for it – problems with parking! I also rank hidden storage VERY high. We moved from a house with two attics and a storage loft in the garage to a house that is 1000 sq ft bigger but has tiny closets and no other storage. By no means am I complaining about the size of my house, but it seems a lot more crowded when you have to *look* at everything all the time. These are lots of awesome comments. I think you should also ask yourself, in terms of renovation costs, when you can afford to dig in. If you have to move in right away, you need to make sure the house is livable. Especially if you have kids or pets. If you have time, then you can be more flexible on bigger projects. My architect parents always say that paint can be fixed, molding can be put up, but you probably don’t want to rip up your floors while you’re living in the house. Pay attention to where your house sits. In SC, you need to think about flood waters during/after hurricanes. Just think of how much money you want to invest and the things that would be impossible (literally or financially) to do. Also teeny-tiny bedrooms are the worst! Who cares if you have a four bedroom house if you have to jump in your bed from the doorway! Space that works for your family is important. I don’t mind painting over ugly wall colors, but painting over bad trim can be a real pain! For me, the trim color was dark and high-gloss–it took endless coats of primer to cover, and the end result looked bad–just too thick! We ended up re-trimming the whole house–a pricy move, but not worth the headache of re-painting. Also, replacing windows and doors is a big expense! And something that goes overlooked IMO. I am surprised at all the emphatic suggestions to get an inspection. Is it not required in every state to get one before you buy? Our bank would not loan us money without an inspection. I checked the sexual predator website before we bought our house, too! Anyone know if it’s required all the time? I think in Virginia it’s optional but I’m not sure. Some banks require it, but when people are putting up “cash” (and getting a loan on the back end), that goes out the window. My lender required an appraisal, but not an inspection, and I definitely have a traditional mortgage! These are all great ideas — thanks so much for posting this! My husband and I are going to be beginning the hunting process, so this helps a lot. We love the character of older homes, but you’re right — sometimes cosmetic things can be off-putting. ;-) However, those things can all be changed, so thanks for the reminder! I agree with both of your lists… my #1 “what to look for” is LOCATION! I read an interesting article a week or two ago that said if Starbucks is building a shop near your home it is probably a stable housing area. The focus was mostly on the amount of real estate research the company does in order to select their locations. After location I look at structure… living in Texas, foundation problems are plentiful. I look to see if the previous owners have a soaker hose in place around the house, under the sinks for water damage, cracks etc. Price is somewhere in that mix too… once that list has been “approved” it’s worth bringing in an inspector / structural engineer to check out the bones. 2. Electrical outlets. We have one whole wall of the house (front to back) with absolutely no outlets. Not to mention none in the hallways, which makes vacuuming fun. 3. The quality of the windows. I replaced them all – very pricy. 4. Listen for leaks in the plumbing. Let water run for a long time. Someone in your house take 30 minute showers? Run that baby for the 30 minutes and see what happens. We missed the mould that spread across the bathroom ceiling and the leak down the hallway wall below it. 5. Anything not cosmetic that is going to be expensive to fix – water, electricity, heating, etc. Check it all and then check it three more times. Unfortunately, we had a realtor, a home inspector and a lawyer who all were, well, we’ve been paid and don’t care about the issues, so be sure you can trust the people you’ve hired to help you with all of this. We just purchased our first home and are so excited! The hardwood floors are beautiful but pretty scuffed up and we wanted to refinish them but we have a toddler and another on the way and I remember you mentioned the smell was really strong when you had yours refinished in your first house. I’m wondering if you have since heard of a more natural/less toxic option for staining hardwood floors? Oh yes, if you go to greendepot.com and check out the stain and sealers for floors, they’re all eco and you can order them to come straight to your door! When I was looking for my house 3 years ago, I didn’t have a lot of money, so I was limited in what I could purchase. When I was looking, I wanted at least one bedroom with a door (since I was looking at shotgun style houses), no cellar doors or laundry in the kitchen, and no sloping floors. These were all things I found in LOTS of houses! My house now has one corner that slopes a bit, but the house is 112 years old and otherwise fine. I, of course, got an inspection report! This house pretty much said “come bring your paint brush” because it was outdated and dirty dirty dirty. Luckily I can look past the ugly vent pipes going through my shower and dirt on the walls and find a beautiful house underneath! There were a few things I would have liked to be newer, but I liked enough stuff about my house that they didn’t become deal breakers, such as the furnace being old and original windows. I actually love my original wood windows in my house. I just use plastic and caulking to keep them leak free! My house had an outdated kitchen and bathroom, but I can live with the bathroom for a few more years. The kitchen has already been updated with new tile and new (to me!) cabinets cheaply. And I had original hardwood heart pine floors under the nasty carpet, so my dad and I refinished them ourselves and they are absolutely beautiful! They have their share of imperfections, but I think that’s what I love about them! 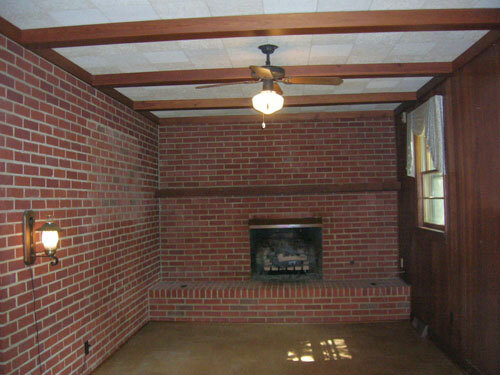 Plus, I have a beautiful fireplace and garage that were a huge plus when buying the house! 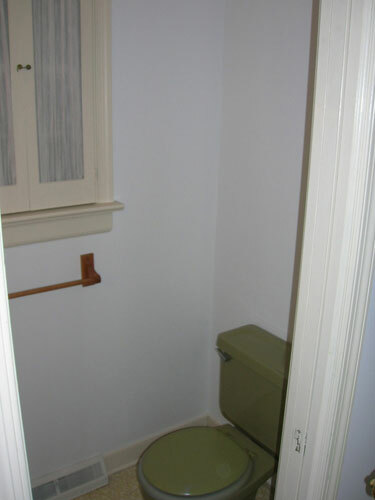 When we were house hunting this summer, we looked at a lot of mid-century homes, too, and noticed a really bizarre trend of creepy basement bathrooms. I mean, if you’re going to add one doing so in the basement makes sense, but maybe use drywall instead of bricks? Or have a ceiling more than 6 feet high? Or a door instead of a curtain? Oh! Oh! We also saw a kitchen with the original stove from the 40s… that you had to light with a match. Whaaaaat?! Basically what I’m saying is, if your basement bathroom reminds you of Silence of the Lambs, it might be a problem. I would add that you may want to find out about covenants and restrictions. If you live in a newer neighborhood, there may be a neighborhood association that you have to join and pay into monthly or yearly. The perks may include usage of a pool and/or tennis courts, and this is appealing if you have kids. However, if you don’t want to be told what you can and can’t do to the exterior of your house (among other things), you might want to look for a neighborhood that does not have restrictions. Def check into it, like if the people in the ‘hood are happy with it and what not. Also, if you are looking at a house in a historic district, if the district is listed on the state or National Registers, there may be design review guidelines that you will have to follow. These guidelines protect the historic integrity of the neighborhood and preserves the important architectural features that makes a house historic. If you need to do anything to the exterior of the house, you will have to fill out some forms and go before a review board (although it’s usually not as dramatic or scary as it sounds). Just wanted to throw all that into the mix – it’s not always about gross carpet and bad wallpaper! Great tips everyone! So much fun to read! Love this post. I’m many years away from buying a house, but I’m keeping all this in mind! -We looked at the “bones” of the house- the roof, the structural stability, the age and quality of the appliances (not just the kitchen and washer/dryer but also the furnace, air conditioner, garage door & opener, etc). -We were very wary of modifications done to the home that did not look professionally done. If the craftsmanship looks shoddy to the naked eye, then how safe is the wiring, structural stability, etc. Did they check with an architect or engineer before moving that wall? etc. -We looked at how many owners a home has had. We ended up settling on a 1970’s split level purchased as an estate sale when the original owner passed away. The longer someone lives in a house, often times the more they invest in the “bones” of the house. In the end, you want to protect yourself as much as you can, but there will always be financial surprises no matter what house you buy. So the smartest thing you can do is to have a good chunk of money in a “house savings” account- for both planned home repairs and those incredibly frustrating unexpected home repairs. Husband and I looked at about 50 houses before we bought. 1 because I am picky about layouts and 2 because it is HARD! anyway we love our house now (after some hard work). Good luck to all house hunters! My method was part hobby, part method and part instinct. Hobby: I’m a Zillow.com junkie. I can admit that! :D. I love to look at house listings, and not just around my neck of the woods, either. Anyway, I first saw the house I own now nearly 8 months before I ever went inside it. It was listed on Zillow and in the town where my son and DIL had rcently moved. It was a cute (and small) brick, single story home. But it backed up to a business on a main thoroughfare and I wasn’t looking to move anyway. Long story short, in January 2011, my son and his wife were late meeting me for dinner nearby that house and I decided to kill time and see if I could find it. I could AND it was still for sale AND the realtor was holding an open house. And nobody was there so if I stopped by, I wasn’t taking attention away from a real buyer, right? Method: walking in through the side door to the tiniest kitchen I’ve ever seen outside a boat or popup RV. Oh no. But there’s an even tinier front entrance that shares the front corner of the house. Take down two walls, and nearly double the kitchen size (to 110 sq ft, so kitchen goes from tiny to small :D). Back half of the house consists of two bedrooms and the bathroom. And there’s a full unfinished basement. Because the basement is unfinished, you can see all the wiring, all the plumbing, all the joists. Which gives me the first inkling that this might be doable–much less a pig in a poke. Instinct: walking back up the basement stairs, on the landing, the upatirs carpet stops two inches shy of the edge of the basement stairs. Revealing hardwood. I believe that right there was where I began to make the decision to put in an offer. On a house I was never looking for or intending to buy. That was a Sunday. I applied with my credit union for the mortgage on Monday and got my letter of approval that day. Wednesday I made the offer. Friday they accepted. I moved in March 1, 2011. In my town (Perth, Western Australia) asbestos is a huge issue, a normal house here is double brick with a tiled roof, but a lot of WW2/post-war era homes where made out of wood frame clad in asbestos right up until the 1980’s. Our house was built 1989 and still has asbestos fencing which is now broken and needs to be replaced. Asbestos is really nasty stuff when inhaled (=irreversible lung cancer) and was used a lot as insulation, waterproof walling in bathrooms, car brake pads up until a couple of years ago, fireproof walling behind kitchens, fencing, interior walling and under eaves. In our area, because it’s so deadly removal has to be done by a licensed practitioner who has to take a lot of safety precautions (=$$). So if you do find ageing asbestos in a potential home, it’s worth being aware of the risks. That being said, asbestos in good condition is not at all deadly – just when it starts breaking down. It may not be such a problem in everyone else’s area, but it was used all over the world and I would definitely keep it as another thing to be aware of when buying a home. Hahahah! No way! Last night I had a dream that a girl with blue hair styled in a mullet came to our book signing tonight and told everyone to leave and that we weren’t coming right before we could come out and they did and then we came out and cried because it was deserted and everyone was mad at us for not coming. Eeks! – LIGHT ! orientation, and size and number of windows (I ve lived in a northern exposure place for a whole year and to ME it was just horrible). Also since I sew / craft a lot, I need a place to work with a lot of natural light. Also I hate rectangular rooms with a window on the smallest edge of the rectangle. – Insulation & heating system, I ‘ll look closely at the windows etc. Love this post and your blog! I would just like to add that we have a local handyman that we use who knows the quality of construction of the houses in the area. Next time we buy again, we have already suggested taking him with us to evaluate some of the finer details of the structure that we may not pick up on. Unfortunately, we found some water damage and structural issues in the house we are currently living in, and he always says when he comes over “these houses went up so quick,” which of course leaves us with a lot of warm and fuzzies :-) I also would suggest taking your time to look and open every window and look at seemingly unimportant things like caulk around door ways and how well the doors seal. Basically, any potential way for water to come in. Happy house hunting! Love this! We bought our first house at the beginning of this year and it turned into a exasperating process. We thought we found the house of our dreams (old and covered in wall paper) but it had great bones and we were excited to start work on it. I can’t tell you how awesome our inspector was. He “had a feeling” about the house and absolutely poured over it. We were there for about 4 hours and he found that the opposite corners of the house were sinking. We would not have even guessed. He tested how level all the doors were since some were sticking and was crawling through the snow and muck in December in Indiana. Luckily, (35 houses later) we found our current home that we love absolutely. I can’t even imagine what we would have gone through if we bought that first house. An inspector is absolutely the way to go! Location, location, location. The only thing about a house you can’t change. If you lo-ove the location but aren’t sure about the house because of the decor, take some photos and then view them in black & white. Sometimes that helps to be able to see past bad/outdated decor. Budget – triple what you think it will cost to make repairs/changes. 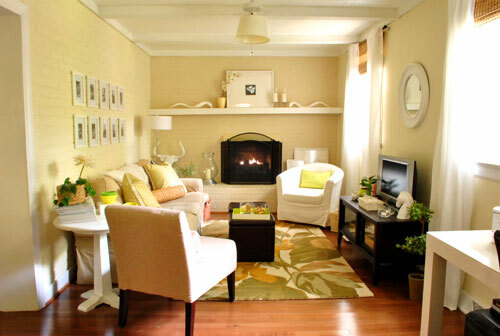 If you love the home layout and the location, chances are you can make it a home that you love. It might cost you – and it will probably take much longer than you hope but hey, it’s an investment. During our recent hunt, I focused on the square footage. ORIGINAL square footage. We wanted an early 20th century home without an addition. And a front porch. And sun! We got it all! But the big thing to keep in mind is lead paint. I feel like we all know it is there, but people tend to ignore or not understand the issues. As the mother of two 3 year olds, lead paint scares me. Knowing full well that our home would be full of lead paint, we had a lead inspection (separate and apart from our home inspection). We did not make the sale contingent upon it (becuase, duh, we knew it would be all over our 1923 home), but we wanted to know where we needed to focus our renovations and where the lead was. The lead inspector was there for HOURS (about 7 to be exact!) and we ended up with about a 50 page document of where all the lead was (including how many layers down!). And we learned a lot, and got great tips for remediating. I am happy to say that two years later, our house is completely renovated with most lead remediated. My friends think I am crazy for being so diligent about lead paint. My kids get their lead levels tested every year (a simple blood test), so I feel confident that our home is safe! Oh yes we do those tests with Clara too! Better safe than sorry! When we purchased our first home, the only criteria we had were price, inside the city limits (requirement for a job my husband was interviewing for), and near public transportation. We ended up with a home built in 1901, that needed a ton of work. In the three and a half years we lived there we de-leaded, refinished the floors, replaced the roof, replaced the windows, converted from oil to gas heat, replaced the falling down fence, rebuilt the falling down deck, and removed the falling down shed. 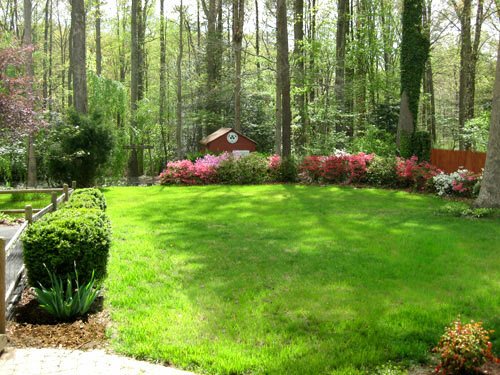 We added trees and bushes to an otherwise barren yard, updated appliances, and of course, painted. That house sucked all will to every have another fixer-upper. Sure, it had “good bones.” The foundation was in superb shape, the basement didn’t leak, and the floors were remarkably level for a 100+ year old home. But the charm of the old house came with a huge price tag. According to the building codes in that city, if we ever wanted to add outlets or move a light switch, all of the electrical in that room had to be brought to current code. Our stairwell was built to 1901 standards (read narrow and steep), and we had to get a code exemption to put in a handrail, because what the city inspector really wanted us to do was tear down a wall and re-do the staircase so it wasn’t an accident waiting to happen. Oh, and the school district left much to be desired, so when it came time to consider our kindergarten options, we were looking at paying for private school on top of all of that. For our second house, we were much more picky. A job change led to a cross-country move, and we decided to rent for a year in the area where we thought we wanted to buy, just to make sure we liked the area. The school district was our first consideration, so we looked at areas within a reasonable commute from our jobs. 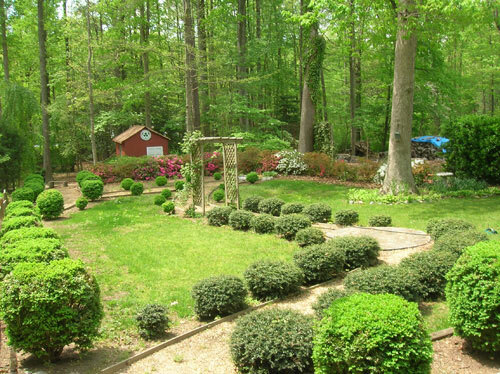 We love the suburb we decided on – there are a ton of kids, great parks, excellent schools, and a nice community feel. For the house itself, I spent the year we were renting looking at online listings so I could get a better feel for what things should cost per square foot, and the general style of various neighborhoods. We talked a lot about the rooms that were a priority; we love to cook, so need a good kitchen, and each work from home at least one day a week, so needed an area we could use as an office. But it wasn’t until actually touring a bunch of houses that we were able to figure out other things we wanted. We decided we wanted all of the bedrooms on one floor, for example. We liked houses where the kitchen and living areas were fairly open to each other, but didn’t like complete open floor plan houses. We ended up buying a foreclosure, where the bank had come in and put in builder-grade horrible beige carpet, and painted every single room the same boring tan color. Just cosmetics, sure. But I think it is important to keep in mind your budget for cosmetics. We’ve been in the house a year, and so far, all but one room is still the boring tan. With three kids, and two parents working full time outside of the home, we don’t have a ton of time to DIY the cosmetics, so it is slow going (I am painting the office this weekend though!). Fortunately, the cosmetic issues with our house are just boring; we can live with the beige indefinitely. But if the cosmetics are truely horrible, I don’t think it is unreasonable to consider them a deal breaker, if you know you don’t have the time or budget to address them in a relatively timely manner. What about houses from 1950’s and before? There are a LOT of those in our area, and that’s probably going to be our price range. They have a ton of character, but the lead paint/asbestos scares me! Lead paint used to scare us until we had both of our homes tested by pros. We learned that while flaking or peeling paint can be a big risk, giving walls a fresh coat of paint if they’re not flaking (none of ours were) is actually how the experts “remediate” in many cases – so it’s not like you have to scrape down the walls or anything to deal with it! In fact they usually don’t recommend disturbing it, so you tend to seal it in when you can. Clara gets lead tests at the doctor regularly and never has any in her system although we have lived in two old homes, so that’s such a relief! As for asbestos, usually in a home inspection they can identify it and suggest solutions (ex: my best friend had asbestos flooring in her basement so they said not to remove it just to float an inexpensive click & lock floor over the top of it and then it was taken care of). Hope it helps! Floors are also an issue. Our first house had beautiful hardwood floors, that had been painted over with lead paint. Covering the floors with carpet, as the previous owners had done, was sufficient remediation, so it didn’t show up on our lead report. After the company we hired to refinish the floors had sanded them down, one of them thought to ask if the paint they had just removed was lead based. It was, and now our home was covered in lead dust. The remediation company we hired put in new door frames, and scraped 5 inches of paint around the edges of the doors. We opted to replace the windows, and that took care of most of the framing too, but the ledges that were not replaced were wrapped in aluminum siding. If your house was built before 1974, get it tested. And ask the testing company to explain what areas they did not test, because they are considered sufficiently remediated already. We went back to our original lead testing company, and they explained all of the areas that were considered already done, but that projects we had in mind would have un-done. For example, the original cedar shingles had been covered with vinyl siding. We wanted to remove, and refinish or replace the cedar. Nothing showed up on the lead report, because the vinyl siding was sufficient remediation. If we’d removed it, and attempted to remove or refinish the cedar ourselves, we would have covered our yard with lead paint chips. No fun. Same deal for if we wanted to replaster the walls, or remove a wall. The lead paint several layers down was considered remediated, but poking a hole through the wall could cause lead dust and flakes to be disturbed. Thanks for the info Jennifer! Great advice! I believe elevated risks depend on the era of your home (if it’s in the trim/doors or just on the walls) and where they find the lead (something like painted over floors might be less common than lead paint on walls, etc). We had lead pros check out both of our homes and they each said none of the windows/cabinets (things in contact with each other) had lead in them (they tested clean) so it was just deep in the wall paint (behind a few layers of non-lead paint). And since they couldn’t find a single flake or peeled area they said there was no exposure risk, but we could repaint everything with a fresh coat to make sure we felt secure! Definitely call in the pros and get your children tested when it comes to lead though! Safety first!